This municipality in the province of Almeria is one of the main holiday destinations in Almeria, a good place to spend the day on the beach and discover a bit more of Andalusia. Located a few kilometres (about 25) west of Almeria city, Roquetas de Mar is one of the least rainy places of Europe, here the sun shines more than 300 days each year. There are large sandy beaches surrounded by dunes, and just 80km to the west is located the Sierra Nevada, the best ski resort in Spain. Roquetas de Mar is also well known for its golf courses, the water sports facilities and the variety of activities provided in the area. If you are travelling to Roquetas, you can't miss Aguadulce harbour, one of the most significant modern buildings in Almeria province. The port has many moorings for small/middle size boats and yachts. Because of Roquetas' excellent weather, there is a lot of activity during the most of the year. 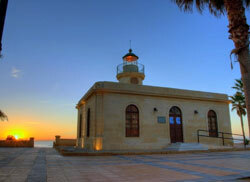 The port is also well complemented with fishing tackle shops, diving clubs and the Nautical Club. Amongst the things to do in roquetas de Mar we can highlight the monuments, its festivities and its fairs. Roquetas de Mar is divided between different population cores that have their own festivities. Amongst the most popular festivities are the Virgin Carmen of Aguadulce, the night of San Juan which is celebrated on the beach, The Bonfires of December, the holy week (Semana Santa), Santa Ana in The Port and the festivity of the Virgin Rosario in the centre of the city. Rebuilt in 2001, it’s currently a museum and an exhibition hall. A tower built as a defensive element during the Arab reign of al-Andalus. This religious temple dates back to the 18th century. This site has been declared as an asset of cultural interest. A chapel from the early 20th century.